Another day, another hyped product! 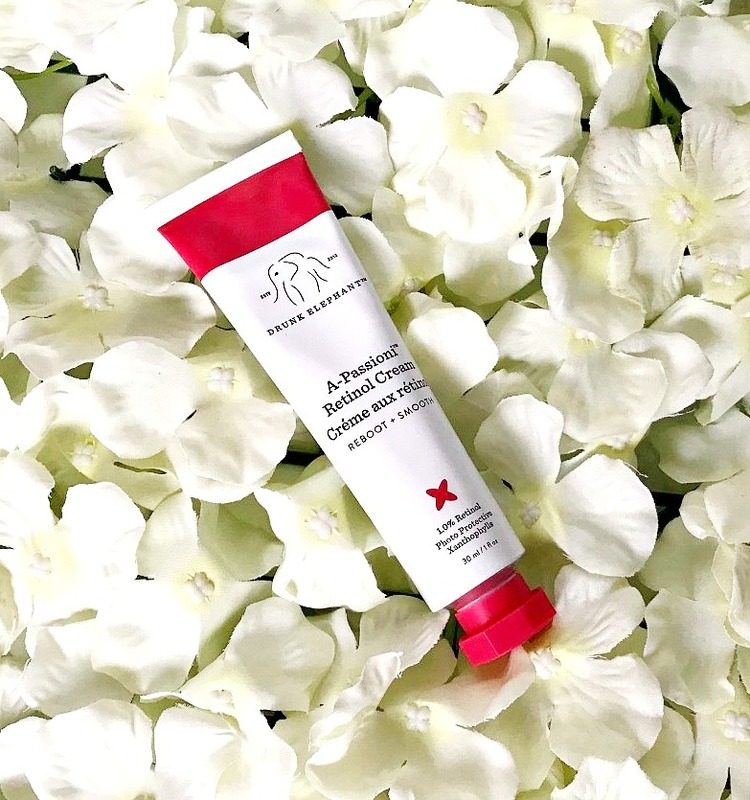 Drunk Elephant A-Passioni Retinol Cream was released late last year and I couldn't resist buying immediately! There is also a mini B-Hydra Serum in the box, which is a very welcome addition as it really hydrates the skin. Retinol (Vitamin A) is widely lauded as being the only proven anti-ageing ingredient but it is also known to improve acne. I have quite sensitive/reactive skin and I can tolerate retinols but I think that if you have extremely sensitive skin, it would be best to start with a very gentle form rather than this product. Drunk Elephant say that you can create a cocktail using a number of their products mixed and then applied to the skin but that just isn't how I like to do my skincare. They also say that this cream can be used both morning and night but my preference is to use it at night only. I have used Retinol products for a few years but I've never used a cream before - I usually use an oil (Sunday Riley Luna, Verso Super Facial Oil or Pestle & Mortar Superstar Oil), so I was curious as to how my skin would react to A-Passioni. It is 1% retinol, vegan and free from what Drunk Elephant call the 'Suspicious 6' - silicone, essential oils, SLS. fragrance/dyes, drying alcohol and chemical screens. Other ingredients include Vitamin F, Xanthophyll and a blend of passionfruit, apricot, marula and jojoba oils. This blend of ingredients is said to eliminate the redness and peeling that can sometimes be associated with the use of retinols and protect the skin from free radicals. Only a small (pea size) amount is needed per use, so although it's expensive at £62, it should last for at least 6 months, if not longer - depending on how often you use it. It is definitely worth starting with just once a week use and building up frequency, even if you are quite accustomed to retinols. The first night that I used this, I applied a small amount to clean, dry skin, avoiding the eye area. I didn't experience any tingling and my skin felt comfortable. The next morning, my skin felt soft and smooth and looked fresh. I decided that I wouldn't use it two nights consecutively and decided to skip it for two nights and repeat again on night four. Again, I woke to happy, comfortable, soft, smooth and bright skin. Getting cocky, I thought that I obviously wan't going to experience any peeling so I then decided to use it every second night - within a week, my face started to peel - it literally felt like a whole layer of skin had been erased. I found skin on my pillow and along my hair line, it was quite obvious. If I touched my face at all, skin would be on my fingers. That being said, my skin didn't feel at all irritated and it didn't look red or inflamed. At this point, I decided to go back to once every fourth night and have now built up to twice weekly. I know that the directions say that you can build up to nightly use, but I can't imagine that I will do that. My skin is very dry but I can't particularly say that this dried it out further, however I did pack on the hydrating serums and oils. The peeling lasted for around four days and I spent those days makeup free - I think applying makeup over it would have been tricky so I was glad that I didn't have to. I have been using it for seven weeks and I have to say that I am loving the results (once I got over the peeling). My skin is clear and my pores are refined. I have also noticed an improvement in texture with my skin feeling very soft and smooth. I've noticed that my fine lines on my forehead are much improved and my skin is glowing (I've done double-takes a few time when passing a mirror because of the glow). Overall, I am very happy with how my skin looks and feels at the moment, which is no mean feat given that it's as dry as the Sahara and the the really cold weather we're experiencing (and knock on effects of an open fire and the central heating being whacked up). I am going to stick with my twice weekly usage as I feel that is what works best for me - this also means that the product will last a long time! I am really looking forward to seeing the longer terms results - particularly over summer when my pigmentation tends to rear its ugly head but at the moment, that isn't an issue for me. A quick word on the packaging - it isn't too fancy but it's functional and I love a tube as it means I will be able to squeeze every last drop out. Final thoughts - stick with it through the peeling stage because the results are worth it! Younger-looking, bright and clear skin can be yours! Have you tried this product? Are you a fan of retinols? I'd love to hear! £62 available from Cult Beauty and Space NK.